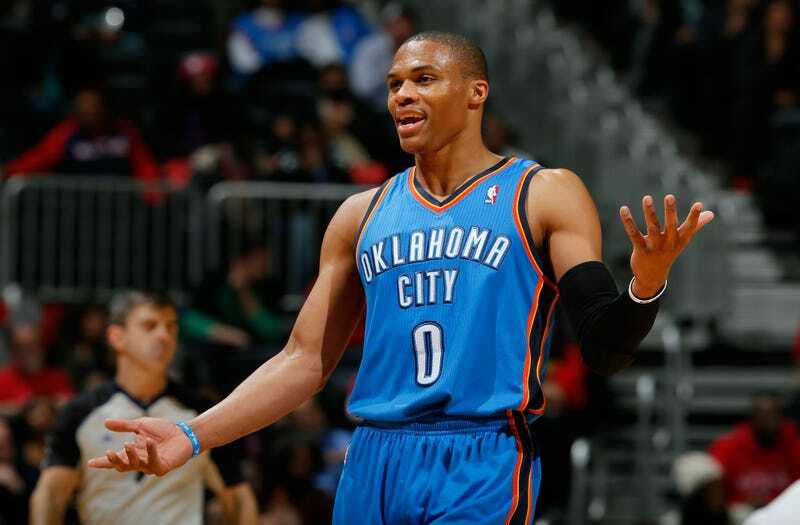 Russell Westbrook needs a hug. According to ESPN’s Royce Young, the All-Star point guard for the Oklahoma City Thunder has been in his feelings since Kevin Durant left the Thunder for the Golden State Warriors. Westbrook feels slighted because he had an open and honest conversation with Durant, hoping to convince the 6-foot-9 small forward to stay in OKC, but he left anyway and has not had a conversation with his longtime teammate since. According to Young, KD’s leaving and the manner in which he left has Westbrook feeling jaded. Russell is not alone. Oklahoma City is still reeling from the departure of Kevin Durant. Apart from burning and shooting his jersey, many citizens of the city demanded that his once-popular restaurant KD's close its doors, and many were emotional as images of him were taken down. Both Westbrook and fans of the Thunder are like the sensitive thugs Jay Z mentions in "Heart of the City (Ain’t No Love)"—they all need hugs. I imagine that Westbrook and die-hard Thunder fans have spent the past few weeks sitting in dark rooms listening to Adele while watching rain streak down their windowpanes. It is clear that this is both a dark time in the history of the franchise and a moment of existential angst in the life of Westbrook. Allow me to offer two suggestions, the former to Westbrook and the latter to both the fans of the Thunder and the esteemed point guard, as you circumnavigate this time of loss and devastation. MVP Russell Westbrook of the Oklahoma City Thunder and the NBA’s Western Conference is congratulated by teammate Kevin Durant after defeating the Eastern Conference during the NBA All-Star Game on Feb. 14, 2016, in Toronto. Westbrook: Look in the mirror. Durant wanted an offense that kept the ball moving and provided him easier scoring chances. The Thunder fired coach Scott Brooks, brought in Billy Donovan, and still the offense stalled out at key moments, often with Westbrook dribbling into oblivion. The Thunder led the NBA in blown fourth-quarter leads last season, despite their firepower. There are things that Westbrook could have done differently, and while I am the first to appreciate his aggressive style of play, that does not mean I cannot also see how someone with Durant’s unique skill set would fear that the team had plateaued. Westbrook, come to terms with the role you played. It’s a necessary step on the path to healing. Westbrook and fans: Listen to Drake—then Oran "Juice" Jones. As for fans and Thunder players alike, I suggest you listen to the Pavarotti of the North as you come to terms with rejection. We’ve all been there, and no one has made a career out of making hip-hop music for the days you cry into your pillow like Drake. Listening to Mr. OVO will help you to come to terms with the pain you’re experiencing, because compartmentalization will only prolong the healing process. Allow me to suggest "Marvin's Room" for its alcohol-fueled pettiness, and "Feel No Ways" as a means to work through feelings of betrayal. Really, just putting Drake on shuffle will do the trick, but starting with Views and working your way back will assist in your healing process. At some point, you must move on. One cannot cry unendingly, and anger is an emotion effective in its ability to inspire forward momentum. To help in your attempt to build up enough disdain to eschew KD and thereby move on, allow me to suggest "The Rain" by the esteemed urban rhetorician Oran "Juice" Jones. Hearing him say, “You gotta get on outta here with that alley-cat-coat-wearing, punch-bucket-shoe-wearing crumb cake I saw you with. ’Cause you dismissed,” is just what you need to properly frame the way you want to think about your former superstar. Listen to these two artists and you will cultivate the emotional fortitude necessary to move forward. Westbrook needs to come to terms with the fact that while he is without question a great player, his style of play might not have been what KD saw as a formula that could win. Both Thunder fans and Westbrook alike need time and space to mourn. Hopefully, one day, once they have sufficiently grieved, they may be inspired to send Durant a sympathy card expressing sorrow for his loss of both great teammates and a great fan base. Dub Nation has grown exponentially in the past year, but they are about as loyal as Donald Trump to a promise to make America great again. Most of the people wearing blue and gold these days aren’t loyal. KD will learn that soon.